When I think about being a kid at the mall, I think of three things: begging my mom to buy me Limited Too pink cargo pants, sneaking into PG-13 movies at the theater, and Auntie Anne’s pretzels. Auntie Anne’s is the ultimate mall food. Growing up, it was a must-stop shop for me and my mom -- a treat we looked forward to every time we had errands to run or sales to dig through. For my mom, it’s always been about Auntie Anne’s signature almond pretzel, indulgently dunked in a tub of thick caramel sauce. It’s my favorite, too -- though as a kid, I bounced around the menu. Some days are sour cream and onion type of days, while others call for raisin pretzel with icing, depending on my mood. In the past few years, Auntie Anne’s menu has grown and expanded. Pizza pretzels are available now (which makes sense because Auntie Anne’s began as a pizza and pretzel stand), as are pretzel dogs. Auntie Anne’s can be found in the freezer aisle of your local grocery store, serving up frozen pretzel sandwiches and baking kits. You can buy buckets of Auntie Anne’s pretzel nuggets for parties (or just for yourself, I’m definitely not judging). With eight pretzel flavors on the menu, three different dogs, and nuggets galore, I figured it was time to rank them. 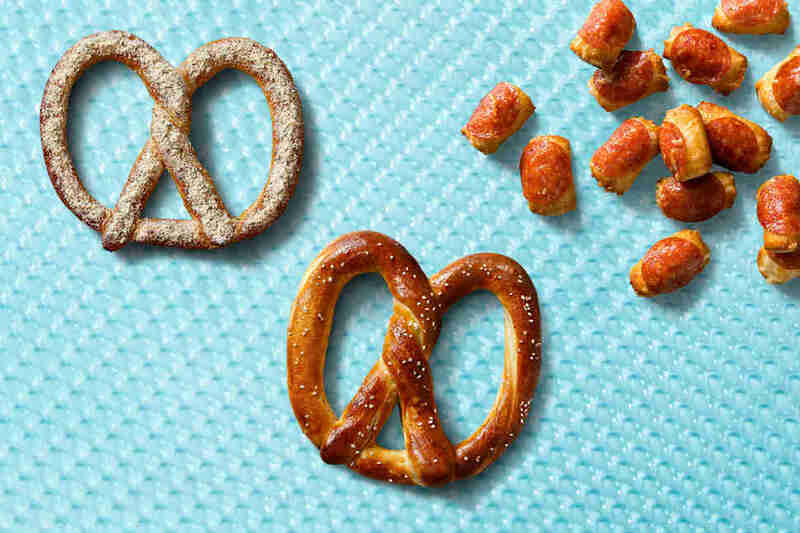 While it might not sound like it, it’s extremely hard to rank pretzels. Different flavors are for different moods. Sometimes, after dinner when your sweet tooth hits, a cinnamon sugar pretzel is what you really need. At a baseball game, a classic salted pretzel with cheese tastes like summer. So to properly rank these pretzels, I judged them based on their overall flavor, their versatility (especially with the accompanied dips), and how messy they were to eat. Jalapeños, cheese, pretzels, and hot dogs is a combination of all the things that I enjoy. But together, this jalapeño and cheese pretzel dog falls a little flat. Here’s why: The dough felt a little bit underbaked and wet, most likely because the moisture of the jalapeños weren’t letting the pretzel cook all the way. Don’t get me wrong -- I love a pretzel dog. It’s an easy-to-eat lunch and the pretzel wrapper is soft and tasty paired with the snap of the Nathan’s hot dog. But am I going to Auntie Anne’s to eat a plain hot dog? For the most part, no, which is why this original pretzel dog is relegated to the bottom part of this list. I wanted to genuinely love this pretzel! It is just like the original salt but loaded with jalapeños on top. Because the pretzel is weighed down by hefty jalapeños that release their pickling juices as they bake, some parts of the pretzel felt a little soggy and vinegar-y. That being said, this pretzel pairs beautifully with cheese sauce or cream cheese (if you’re in the mood for a jalapeño popper) and has a very mild, pleasant heat. Is it my favorite pretzel ever? Far from it. But it’s still a solid treat if you like salt and spice. 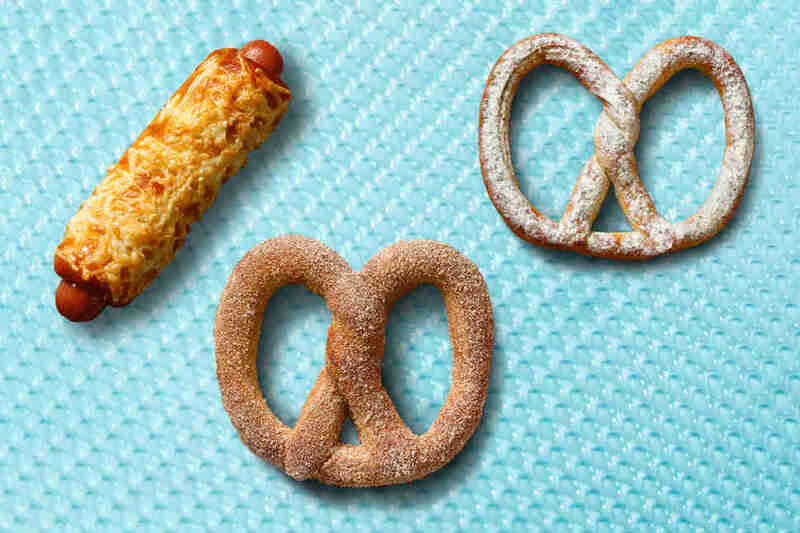 Note: this pretzel isn’t carried at every Auntie Anne’s location, so keep that in mind if you’re craving some heat. Warning: Do not eat this pretzel if you have to talk to anyone afterwards. My breath was kicking. It does taste like garlic, but the Parmesan flavor is less pronounced and the powdery residue of the flavoring kind of got everywhere. It was definitely missing that funky cheesiness I crave from Parmesan. I liked this pretzel, but I don’t necessarily want to have to brush my teeth after eating a snack. I know, I know, this is kind of the pretzel. It’s versatile and salty and tastes like Disneyland and baseball games. But just because this is the original pretzel doesn’t necessarily make it the best. I find this one to be a bit too salty for my taste -- I often flick off flecks of salt just to make it more palatable. However, it isn’t messy to eat and goes great with dips, so it definitely redeems itself in those categories. I really appreciate that each pepperoni nugget has a whole pepperoni on it. These pillowy nugs are covered in cheese and taste adjacent to pizza, which is always a plus. But for some reason, the ratio of the whole pepperoni to the smaller nug just overwhelms the dough. If you’re super into eating pepperoni straight up, you will like this. I prefer a balance of meat to carbs, and therefore I’d rather get the pepperoni pretzel over the nuggets. The cheese pretzel dog is a combination of all things I love -- cheese, hot dogs, freshly baked soft pretzels -- that actually works. The cheese is melty and slightly crispy on top, which pairs nicely with the saltiness of a Nathan’s hot dog. 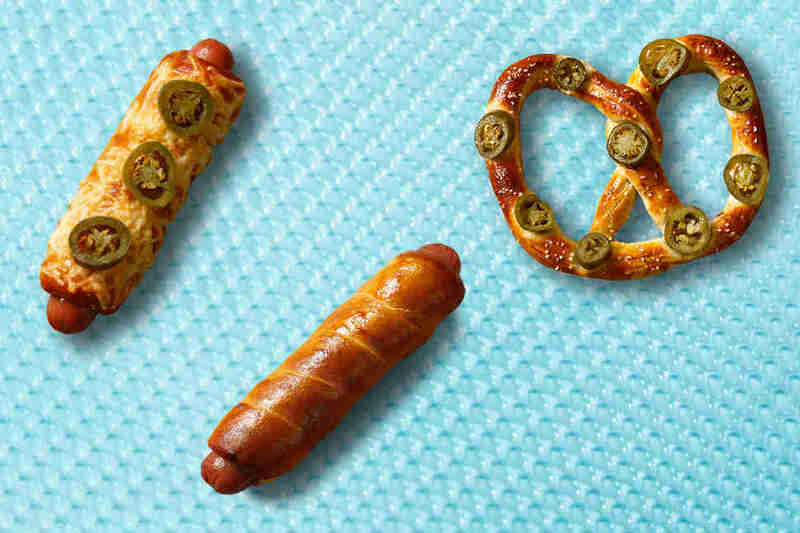 Of all the pretzel dogs, this one really gets it right, both in flavor and texture. Marry this cheesy pretzel dog with even more cheese from the cheese dip and you will be left cheesin’ (I’m not sorry). Ah, a classic. Dust anything in cinnamon sugar and for the most part, it will taste good. The same goes for this glorious pretzel; you can’t really go wrong with warm, soft dough coated with what is definitely more than your allotted daily intake of sugar. The only real issue with this sweet treat is that the sugar gets everywhere, and for that, it remains in the middle of the pack. Oh man, I used to love this pretzel when I was a kid. It’s like eating one of the best potato chip flavors in pretzel form. These days, the kick of sour cream and onions is a little bit too intense for everyday consumption, and the flavoring dust that covers the pretzel floats everywhere and leaves your fingers sticky. Despite all that, it’s still a pretzel I would turn to when I have a craving for something savory. I know I said earlier that I don’t go to Auntie Anne’s to have a hot dog, but how can you honestly resist a bucket full of pigs-in-a-pretzel-blanket? They’re just somehow cuter -- and better -- in their miniature size. They’re delicious dunked in cheese and honey mustard, easy to share among friends, and just taste better than a regular sized pretzel dog for some reason. Maybe they bake more evenly because they’re smaller? Whatever the reason, these rule. These are like the cinnamon sugar pretzels, but better, because they come in a cup and the sugar stays a bit more contained. They’re fun to pop in your mouth and easy to dunk in a tub of sweet glaze or caramel. 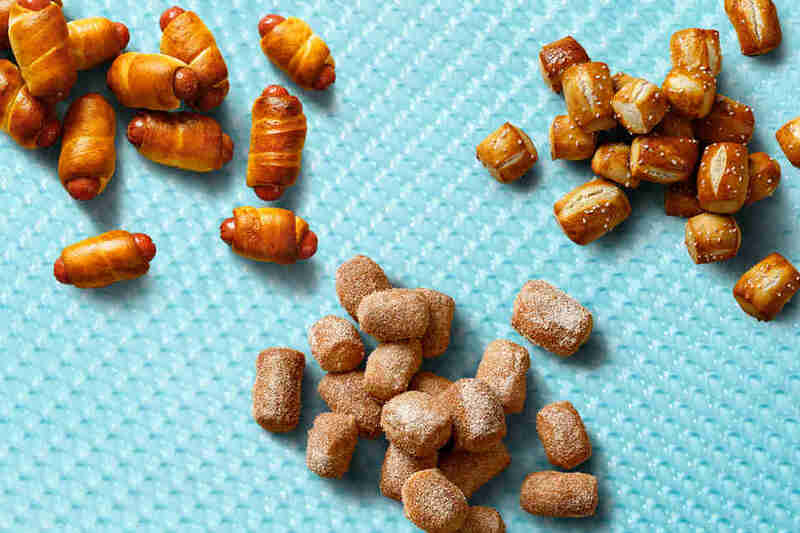 I find that the nuggets get a more even coating of sugar than the regular pretzels, and even if you come across one that is lacking, you can always find more sugar at the bottom of your cup. These aren’t quite as salty as the original salt pretzel, perhaps because they have less surface area and don’t accumulate as much salt. I prefer the nugs over the actual pretzel because they’re easier to eat and dip, yet they still have that same familiar taste as the original pretzel that made Auntie Anne’s what it is today. They’re the sequel that actually did better than the original. Are you shocked that a raisin pretzel could be this high on the list? Are you grossed out? Well, you shouldn’t be. Raisin pretzels are good. Raisins in general are good! The dough is buttery and subtly sweet, with gems of raisins hidden inside for a plump, fragrant surprise. It's perfect dunked in a tub of the sweet glaze. The worst part about this pretzel is that it’s only offered at select Auntie Anne’s, so make sure you call your local Auntie Anne’s to see if they have it first (Auntie Anne, if you’re reading this, please bring these pretzels to every location. America needs it). This pepperoni pretzel is the ultimate savory pretzel. It’s a bit flatter than all the other pretzels -- I think the weight of the pepperoni doesn’t allow it to rise as much when baking -- and that somehow makes me love it even more. The cheese is salty and plentiful and especially delectable on the edges where they’ve crisped up in the oven. 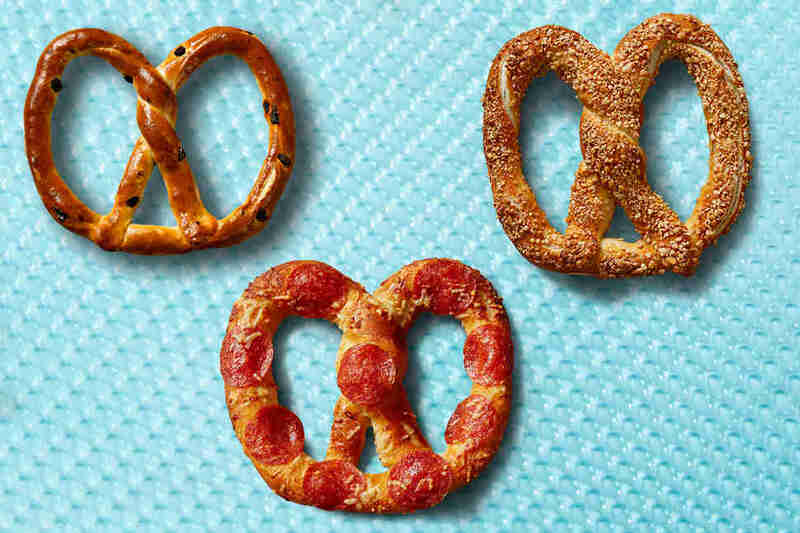 There are nine pepperonis that decorate the pretzel for the perfect ratio of bready goodness to cured pork. Dip this pretzel in marinara if you want a true pizza experience. This is a combination of everything I want in a pretzel: rich, yet subtly sweet, texturally fun, and a baked, golden brown masterpiece. The almonds are nutty and crunchy and hold on tight to the pretzel so that this isn’t a complete mess when you eat it. This goes perfectly with Auntie Anne’s caramel dip, but also tastes amazing with the sweet glaze, too. 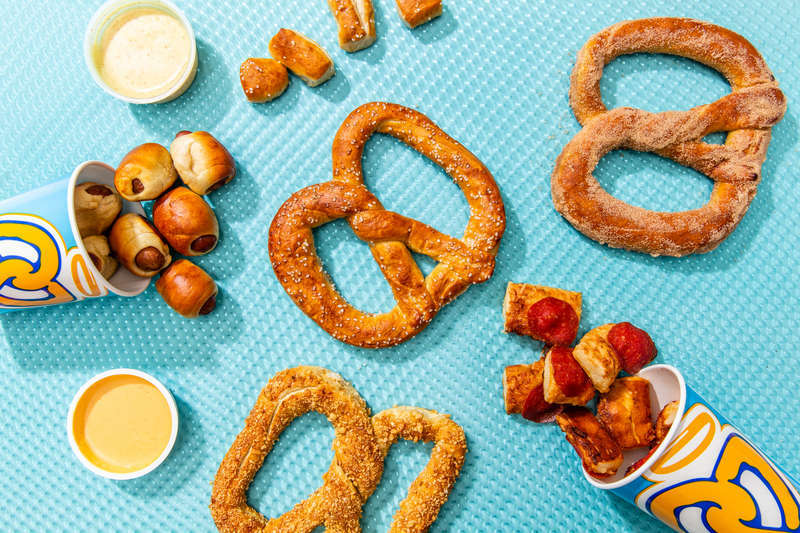 It’s the best snack, dessert, and pretzel -- thank you, Auntie Anne’s, for creating twisted perfection. OK, honestly, I’m not one to usually enjoy dipping anything in marinara (yes, I like my mozzarella sticks plain). If I’m going to dunk a perfectly good pretzel in marinara, it better be hot and fresh, tasting like burst tomatoes with a healthy dose of garlic. Unfortunately, this dip is neither of those things! It’s a touch too sweet for my liking, with unidentifiable chunks that were unpleasant to eat. If it’s up to me, I’d rather have my pretzel plain than with this dip. Pass. What can I say about this dip? It’s straight up cream cheese. It is familiar. It goes well with bagels -- and I guess pretzels too. It’s just not that exciting and not necessarily what I would turn to to pair with a pretzel, but it’s versatile in its ability to pair with both sweet and savory pretzels, and for that it earns more points than marinara. This dip is very sweet, so if you don’t have a sweet tooth, this one might not be for you. That being said, it goes well with a cinnamon sugar pretzel as well as a raisin one. It’s basically just sugar water -- and I’m not mad at it -- but other dips are just a bit more nuanced. Cheese dip is good! It’s a classic. It’s reliable. It will always be there for you. Does that mean it’s the best dip out of all of Auntie Anne’s dips? Absolutely not. 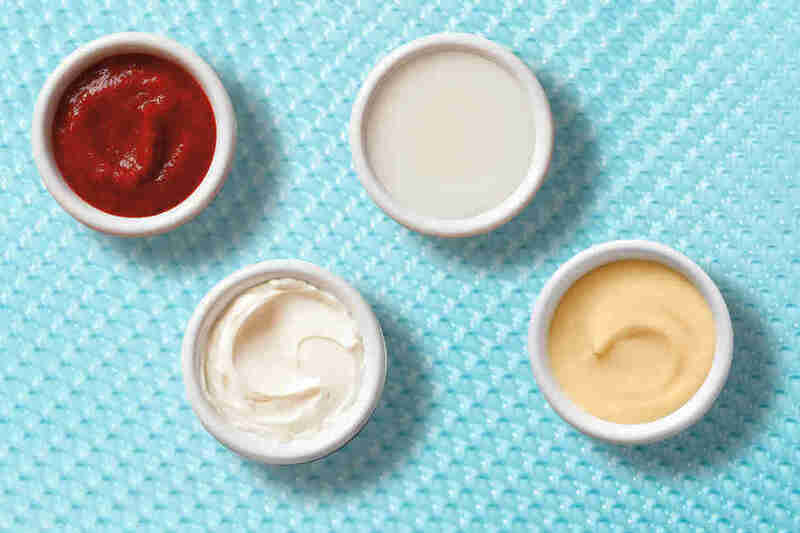 But it’s versatile and tasty -- and a little bit waxy -- landing it at the center of our dip ranking. This came as a surprise. 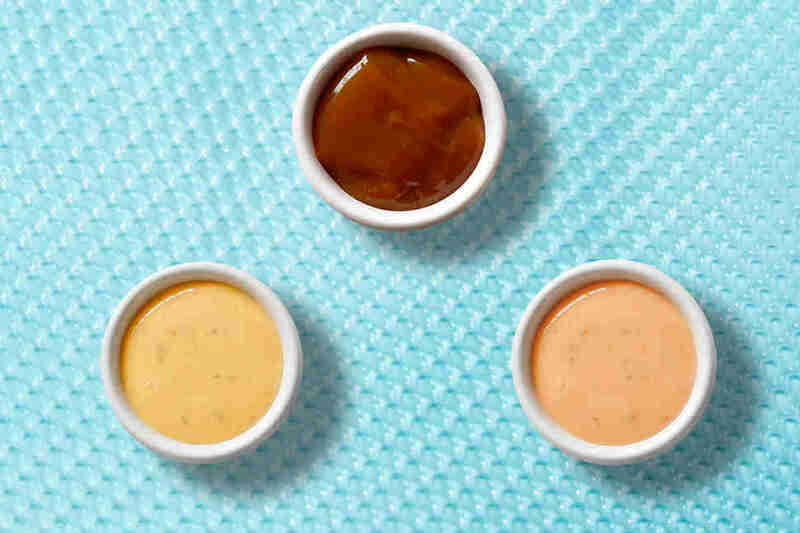 I love honey mustard; it is perfect on chicken tenders and nuggets and basically all things chicken. Would I ever go out of my way to order it for my pretzel? Prior to this taste test, I wouldn’t have, but now I am strongly considering it. Auntie Anne’s honey mustard dip is the perfect balance of sweet and savory. It’s not too acidic or sharp from the mustard, and remains a nice, creamy consistency. It also went well with the majority of pretzels, and for that I give it major props and a bronze in this pretzel dip ranking. This dip takes me back to when I was 7 and 100% scraping my finger in the tub to finish it off because I was gross and shameless (and maybe still am). It’s sweet but not overwhelming so, goes wonderfully with the almond pretzel and cinnamon sugar, and isn’t too runny or overly sticky. I need to preface this blurb by saying that the hot salsa cheese dip… doesn’t actually contain any cheese in it. I mean, there are cheese cultures, and jalapeños, but it doesn’t straight up say cheese in the ingredients. That being said, this dip is delicious. It’s creamy and melty, with the tiniest, slightest heat that just tastes a bit more special than the regular cheese dip. If you’re looking for the perfect pairing to your salty pretzel, you can find it here in the hot salsa cheese dip. Kat Thompson is a staff food writer at Thrillist and lover of soft pretzels. She thinks people shouldn't be so judgmental of raisins. Follow her on Twitter @katthompsonn.